All Fabrics Satisfy Strict Requirements for Hospitals, Rehabilitation Centers, Clinics, Children's Homes, & Other Public Institutions. Our cubicle curtains are manufactured flat and typically sized approximately 10% wider than the track length, unless specified otherwise. The curtain height is determined by the floor-to-ceiling height and curtains usually finish approximately 8-10" above finished floor, as suggested by Joint Commission's patient privacy standards. This distance also allows for ease in periodic floor cleaning and prevents mop and/or floor cleaner from coming in direct contact with cubicle curtain, soiling the treatment. Grommets at the heading are spaced every 6" on center. 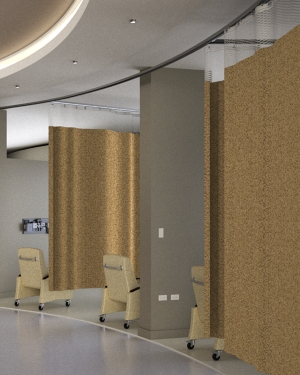 All fabrics used in the fabrication of Hospital Curtain Solution's patient privacy curtains meet or exceed NFPA 701 flame spread requirements for vertical flammability. Flame spread certification paperwork is supplied with invoice for your facility's records. The mesh that is sewn onto the top of the overwhelming majority of cubicle curtains serves an important purpose. The openness, ½" on the horizontal, vertical, or diagonal (70% openness) allows for fire sprinkler penetration in the unfortunate case of fire. As a general rule, if your healthcare facility does not have a ceiling mounted fire sprinkler system, you are not required to have mesh at the top of your hospital cubicle curtains. That being said, most facilities order their patient privacy curtains with the mesh, as it provides for both light and air ventilation throughout the patient room. It should also be noted that medical curtains manufactured with mesh are more budget conscious than those without, because mesh is far less expensive than the face fabrics used in the production of the finished curtain treatment. To shop online for a wide range of our most popular Hospital Cubicle Curtains via credit card, click on Hospital Cubicle Curtains or on the shopping cart image at the top right hand of the page to go to our user-friendly Online Store.